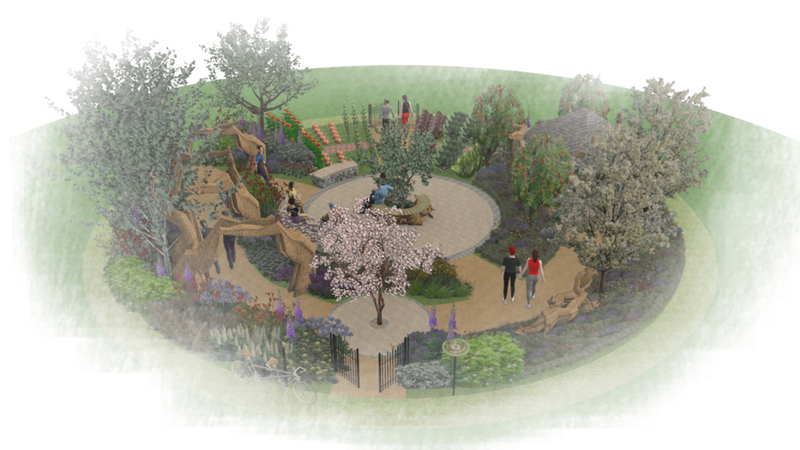 The Blind Veterans UK ‘It’s all about community Garden‘ at this year’s RHS Hampton Court Palace Flower Show, (3rd to 9th July 2017) is being designed by Andrew Fisher Tomlin and Dan Bowyer with contractors Landform Consultants. 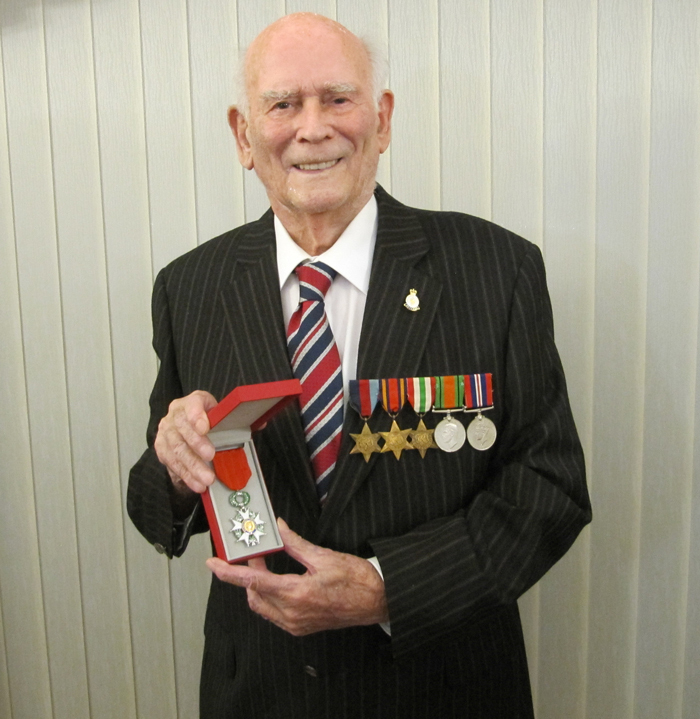 The members, volunteers and staff involved in Blind Veterans UK are an inspiring community who come together to ensure veterans recover their independence and discover a life beyond sight loss. The garden reflects this sense of community highlighting the supporting roles of the Charity in bringing people together, supporting passive and active therapy and providing vital life skills and independence. The garden, the largest at the show this year, features traditional stone, oak and willow, coming together with ornamental trees, flowers, an orchard and a kitchen garden. The major structure is a willow vine sculpture that wraps around the whole garden created by Tom Hare. Roses, dahlias and grasses are included in a contemporary planting style with a kitchen garden that uses unusual species of edibles chosen as much for their fragrance as their use. Some of the plants for the garden will be supplied by a blind octogenarian Fuchsia grower and there is a contribution from a blind veteran who makes garden sculptures out of scrap and other crafters who are producing hens made out of braille paper. 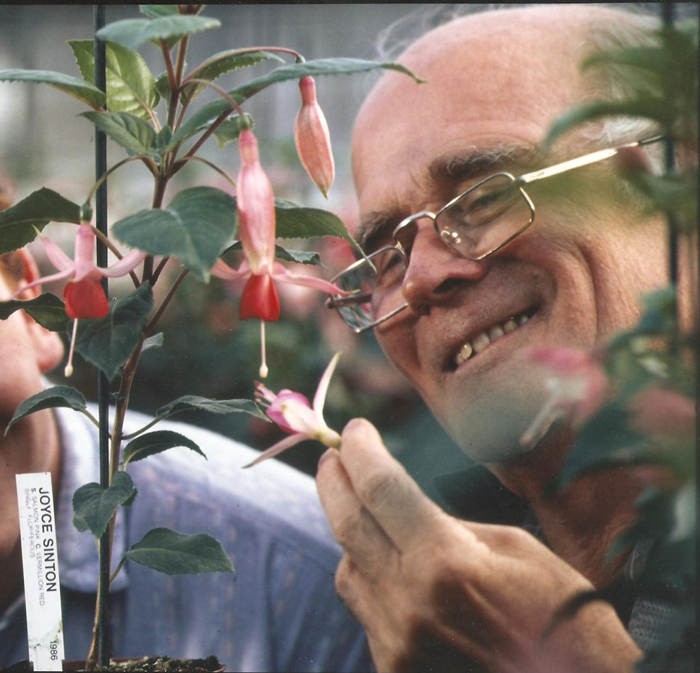 Roy Sinton (92) is a blind veteran from Formby (pictured above) and he will supply the fuchsias to the garden through Sintons’ Nurseries, the company he founded. Unfortunately, for Roy, his eyesight has long been a troubling factor in his life, though he admits it wasn’t until six or seven years ago that it began to severely impact his day to day capabilities: “I already had age related macular degeneration, so it was gradual, but still very tough,” he says. “I can’t read anything, but I can see people walking towards me, and from about two or three paces away I can recognise them“. For Roy, gardening has been a passion of his for as long as he can remember down to the fact that when he was just three years old he asked his parents for a fork and a rake while his brother asked for a football. When Roy came home from the Second World War he returned to Manchester Parks where he was offered the position of journeyman gardener until he set up his own business in 1950.Roy has now passed the business onto his son and they are both delighted to have been asked to contribute the fuchsias for the Blind Veterans UK Garden at Hampton Court. Roy explains that they will be supplying 12 fuchsia baskets of the varieties Sir Matt Busby and Purple Fountain as well as six standard fuchsias of the varieties Joyce Sinton and Pattie Sue. The kitchen garden part of the design is being planted by Jon Wheatley who will be using some unusual herbs. After the show the garden will be relocated between two very different locations – Llandudno in North Wales and Brighton on the South Coast.